I’ll start this review by saying that I smiled reading the author’s thank you to Kate Beckinsale at the start. Frank Thornton is an architect by day and a beer guzzler by night, Heineken to be specific. Drinking alone in a bar in New York one evening he is immediately attracted to the red-headed, voluptuous beauty Nessa and he shortly learns she is a vampire. Frank doesn’t let this put him off and they quickly fall in love and declare themselves soulmates. The course of love never runs smoothly, even less so between a human man and strong, 400 year old, female vampire. A demon is stalking the streets of Manhattan and it is up to Nessa to put a stop to its carnage but how will she juggle protecting the man she loves and making her city safe? On top of everything else, a long time enemy of Nessa’s, another vampire Narice rears her ugly head. I had to wonder though, given Nessa’s strength, intelligence and resources, why hadn’t she taken Narice out of the picture long ago? I wasn’t captivated by this story immediately but once the reader is taken back to the beginning of Nessa’s humble beginnings in a Hungarian village four centuries earlier, I was hooked. Her long life’s story was interesting, following her horrific turning to becoming both a lady of society and a formidable vampire, and describing how she came to be in New York. Both characters are likeable but I found that I couldn’t relate to the 21st century Nessa. In the present time, we don’t really get to see beneath the surface of the powerful vampire, as the story is told mainly through Frank’s eyes, and when Nessa speaks, the language seems stilted and awkward at times, which I’m going to attribute to the fact that English is not her first language and that she comes from a different era. Frank however jumps from the page as an ordinary guy just trying to get along in the new paranormal world he suddenly finds himself a part of. Frank drinks a lot! We never see him drunk but he drinks in order to reduce stress, calm his nerves and to aid sleep. He also struggles with the fact that Nessa is the alpha in the relationship, a normal reaction but he is never chauvinistic about it. He is an intelligent man who accepts his partner’s strengths, experience and brilliant mind. The demon plotline comes across as an afterthought. This is a book about Frank’s relationship with Nessa. Anything outside of them is kept to the sidelines. 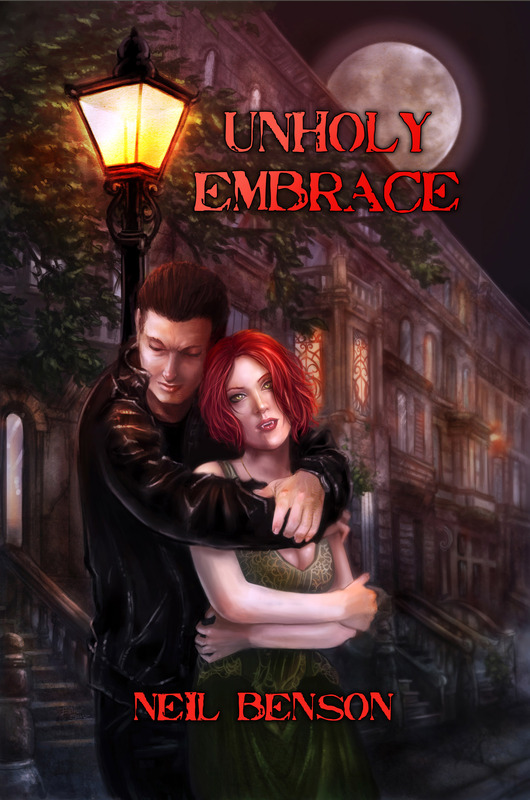 I liked reading a vampire book from a male perspective so I’m glad I had the chance to read Unholy Embrace. That being said there were a few areas that didn’t work for me. The building of the relationship between Frank and Nessa was lacking and Frank’s immediate belief that she’s a vampire seems improbable. There were also some grammatical errors and I felt that the fight scenes could have been described better. The ending was also too rushed. One area I wish to address is that each chapter begins with a quote from a book by Thaddeus Romans, an apparent expert on supernatural creatures. These quotes contain spoilers, revealing what’s to come in the next few pages, unfortunately removing the important element of surprise. I ended up quickly skipping these quotes so the following chapter wouldn’t be ruined for me. One of the highlights was the vivid New York setting and I have to admit that I did find Frank attractive. I’m sure male readers will surely fall as quickly in love with Nessa as Frank did. Her beauty and flaming red hair make her stand out immediately (just check out the beautiful cover). This entry was posted in Book Reviews and tagged book review, neil benson, new york, paranormal romance, unholy embrace, vampire. Bookmark the permalink. Great title for this post!